The turquoise blue of this hotel swimming pool is a surreal contrast to the surrounding desert. 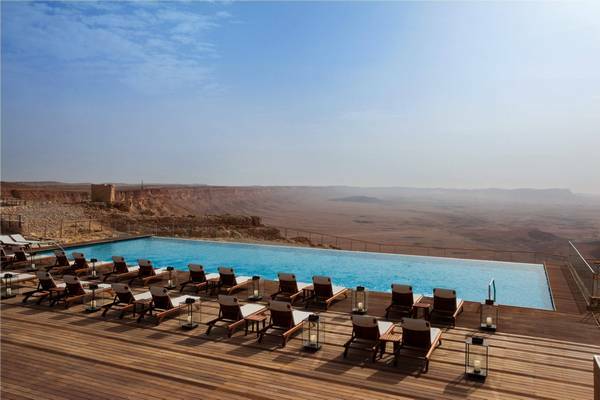 The Beresheet Hotel is located in the small town of Mitzpe Ramon in the Negev desert of southern Israel. 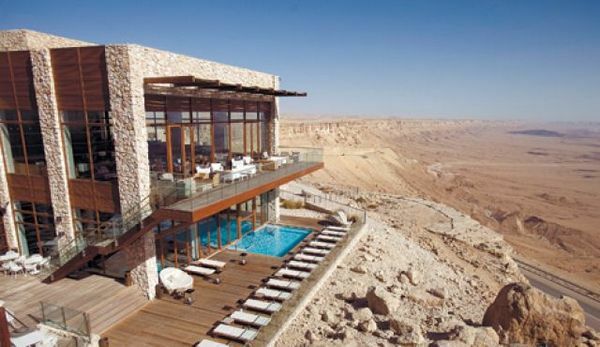 What makes the location of this hotel truly remarkable is the Ramon Crater. 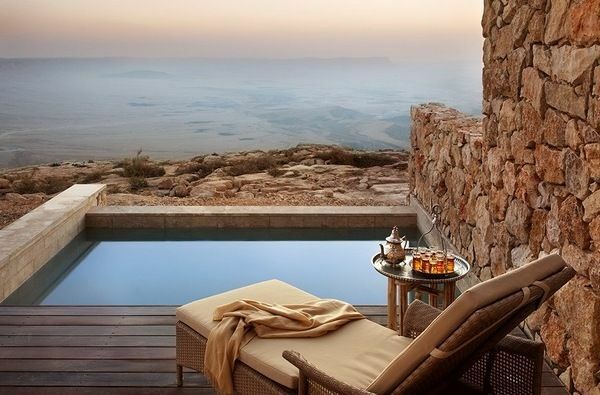 Perched on a cliff overlooking the desert valleys of the world’s largest makhtesh (a makhtesh has steep rock walls surrounding a deep closed valley), hotel guests have incredible views of the forty kilometre long and five hundred metre deep crater. Despite the desert location, the Ramon Crater enjoys a temperate micro-climate. 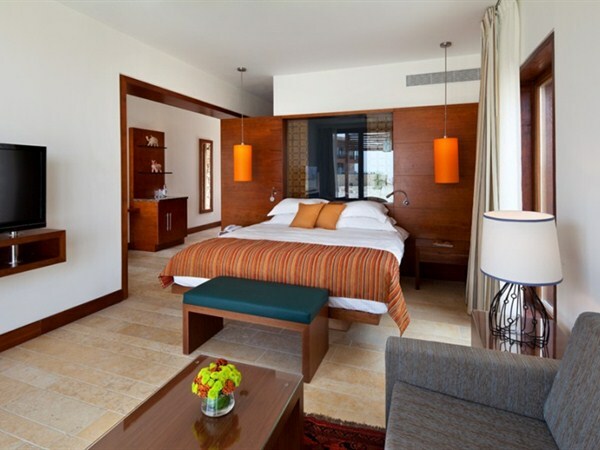 The hotel includes two swimming pools, rooms with private pools, a restaurant (offering family-friendly early buffet dinners) and has family villas suitable for two adults and three children available. There is also a games room for kids. 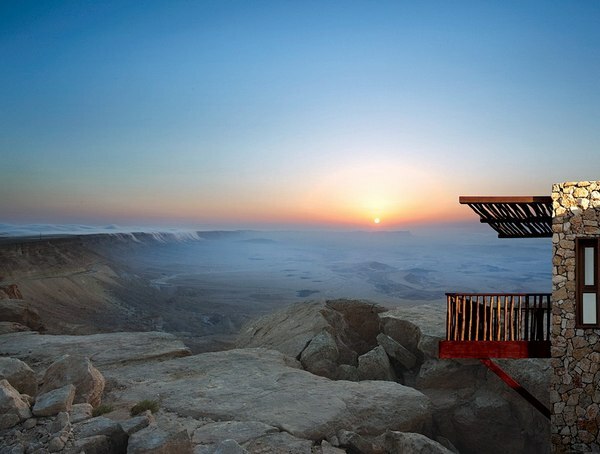 While it would be tempting to laze by the pool, marveling at the view, the Ramon Crater offers a unique nature experience. The Crater and surrounding area forms Israel’s largest national park (the Ramon Nature Reserve) and can be explored on foot (or helicopter for the more adventurous). It’s home to a diverse range of flora and fauna and exposed rock that is two hundred million years old (if you’ve got a budding geologist in the family, that will blow their mind!). 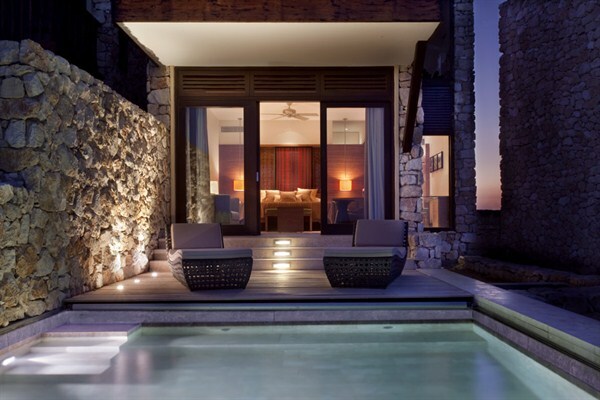 Head to Goldman Holidays for all your online travel and accommodation bookings.